North Korea fired three short-range rockets into the East Sea on Saturday in an apparent display of force against an ongoing South Korea-US military drill which Pyongyang calls a rehearsal of war. Cheong Wa Dae and South Korea’s military said the North launched “several” projectiles from an advanced 300-milimeter multiple launch rocket system and they flew up to 250 kilometers in a preliminary assessment. The US Pacific Command said of the three missiles, the first and third traveled around 250 kilometers in a northeastern direction, revising its initial report that they “failed in flight.” The second one is likely to have “blown up almost immediately,“ it said. 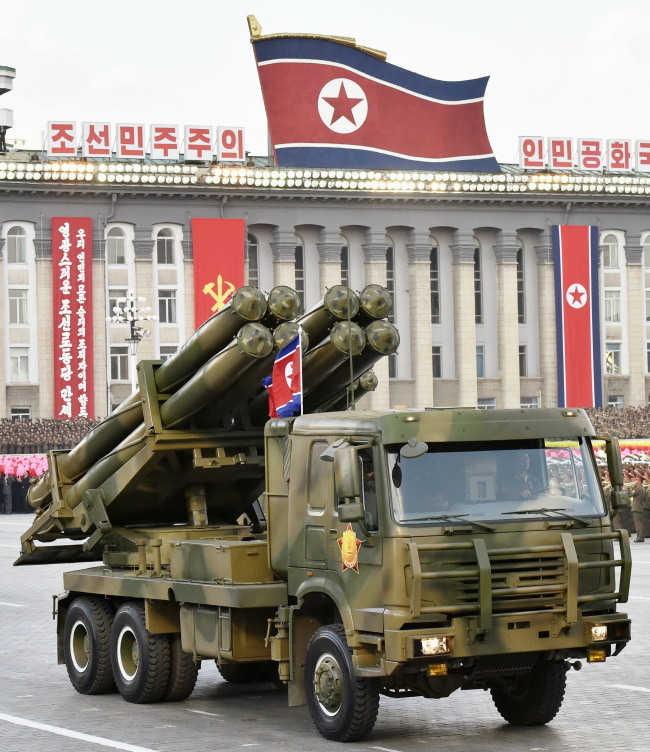 The update appears to be a result of consultations with Seoul, but PACOM defined the three projectiles as short-range ballistic missiles, not the rocket artillery system as evaluated by Seoul. Both militaries said they are working on a more detailed analysis and will provide its outcome later on. But Kim Dong-yub, a former Navy officer and now professor at Kyungnam University’s Institute of Far Eastern Studies in Seoul, said the two countries’ assessments do not necessarily contradict because the 300-milimeter MLRS could be classified as a ballistic missile system given its self-propelled and Global Positioning System guidance features. Following the missile liftoff, South Korean President Moon Jae-in instructed National Security Office chief Chung Eui-yong to convene a meeting of the National Security Council to review the launch, military readiness and the overall security situation. The issue is expected to be on the agenda for Seoul’s Vice Foreign Minister Lim Sung-nam, who departed Sunday for a three-day trip in Washington to meet with US Deputy Secretary of State John Sullivan and other key officials. “During the session, the NSC called for the ongoing exercise to be carried out in an even more thorough manner,” presidential press secretary Yoon Young-chan said. The latest launch came as South Korea and the US stage the annual Ulchi Freedom Guardian exercise which has long been a source of fury for the North. Yet Pyongyang is seen to have opted for a relatively low-level provocation, compared with a test of an intercontinental ballistic missile or nuclear device, amid signs of cooling tension after exchanging a ferocious warlike rhetoric with the Donald Trump administration. So the “low-intensity” response boosted cautious optimism among some observers that the mood may turn around quickly and Pyongyang could move toward talks with Washington. As the rhetoric died down last week, Trump said the North is “starting to respect us,” while Secretary of State Rex Tillerson said “some dialogue” is possible if the regime shows restraint. PACOM, for its part, noted in its statement that the latest test did not pose a threat to the US or Guam. A senior Cheong Wa Dae official also said the launch was not serious but part of its “usual response” to the UFG that has “nothing to do with” a strategic provocation. But such a view spawned skepticism, with some opposition lawmakers and scholars taking issue with what they call the presidential office’s lax security oversight. The conservative Bareun Party issued a statement, saying the missile launch once again highlighted that “what’s open is the door for confrontation, not dialogue” as argued by the Moon administration. Kim, the professor, pointed to a separate report Saturday from the official Korean Central News Agency to say the North is not showing a typical response to the annual drill. 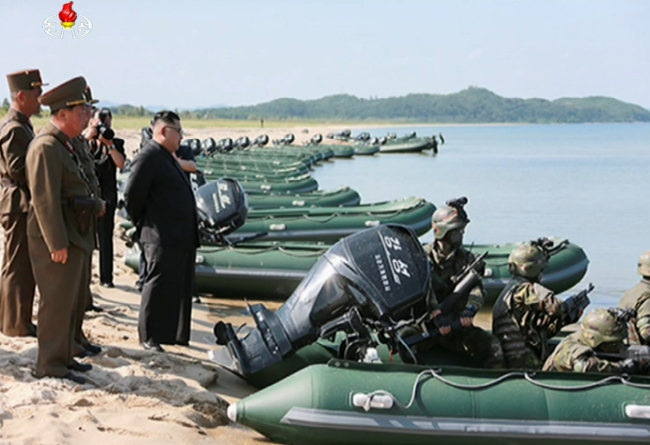 Aimed directly at Seoul, the report said leader Kim Jong-un oversaw a drill of special forces units, designed to seize two of the five major South Korean islands near the inter-Korean border in the West Sea -- Baengnyeongdo and Yeonpyeongdo. In 2010, the communist state launched an attack on the latter island, prompting a trade of fire between the sides’ militaries that resulted in the death of two soldiers and two civilians on top of nearly another two dozen injured. “I’m afraid if the island exercise is for North Korea to show its resolve that it will make the South a sure hostage at a time when there is talk of a US pre-emptive strike and military action against the North after the Guam threats,” Kim said.